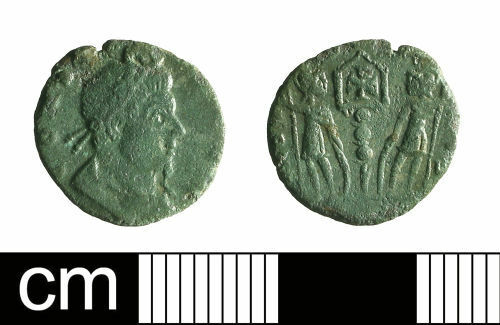 A copper-alloy nummus of the House of Constantine; GLORIA EXERCITVS (one standard) reverse, minted AD 335-341. Measures 13.9mm in diameter, 1.4mm thick and weighs 1.24g. Obverse description: Rosette-diademed, cuirassed bust right, seen from back. Reverse description: Two soldiers and one standard.